Product #16202 | SKU BRCH700 | 0.0 (no ratings yet) Thanks for your rating! 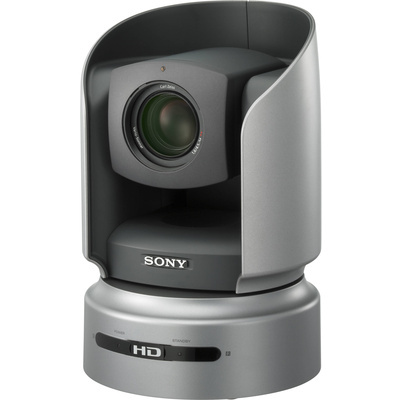 The Sony BRC-H700 is a high definition communications camera built with a pan and tilt mechanism. Its three 1/3-inch HD CCDs with over 1 million pixels each deliver high resolution images and accurate colour reproduction. This camera is ideal for low-light environments. The BRC-H700 comes equipped with a card slot that accepts a variety of optional interface cards, making it compatible with a number of different systems. The interfaces supported with these optional cards include HD-SDI, SD/SD-SDI (down converted), i.LINK (FireWire) for use with HDV systems, and computer XGA. Other features include an Image Flip function for installation flexibility and up to 16 presets for operational ease of use. The BRC-H700 covers a wide shooting range with its accurate Pan/Tilt mechanism. It has a wide pan range of 340° and a tilt range of 120°. Both pan and tilt speeds are variable within the range of 0.25° to 60° per second. This enables the BRC-H700 to capture not only fast moving objects, but also slow-moving objects without rocking vibration. The BRC-H700 incorporates a 12x optical auto-focus zoom lens, allowing for a zoom capability of up to 48x when used in combination with its 4x digital zoom. The BRC-H700 comes standard with a D-Sub 15-pin RGB/Component interface. The unit can also accept a range of optional interface cards that allow for flexible analogue and digital system configurations. The optional cards include HFBK-HD1 for HD-SDI. The HFBK-SD1 delivers down-converted SD-SDI, Analogue Component, RGB and Composite. The HFBK-XG1 will provide WXGA, XGA and VGA computer inputs. The HFBK-TS1 provides FireWire (Sony iLink in this case) for use with HDV systems. This camera can be controlled by external devices such as the optional RM-BR300 remote control unit with VISCA control protocol. All local controls such as Pan, Tilt, Zoom, camera settings and sixteen camera presets can be easily accessed. Up to seven cameras can be daisy-chained and controlled by a single RM-BR300 controller.